The taste is extreme smooth combined with an abundance of fruit – notes of orange, coconut, vanilla, dried peach and banana. On the nose, it is also fruity and sweet notes of orange and coconut. 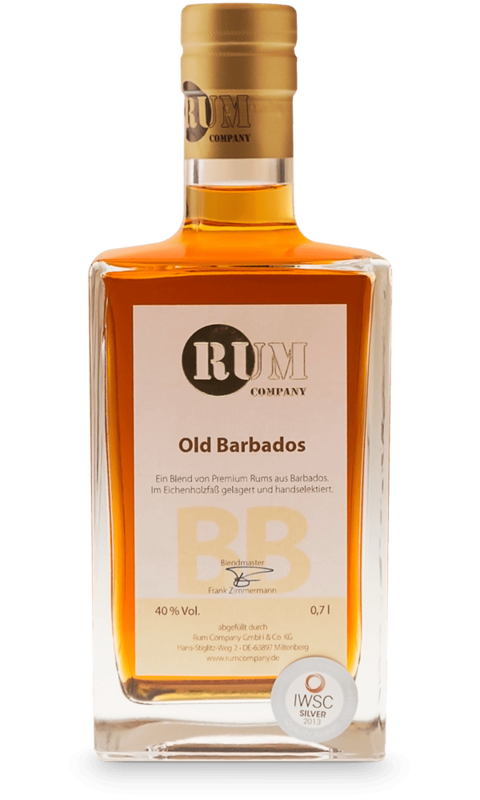 Just like Rum Company’s other products, Old Barbados is a very pleasant rum with a long finish of tropical fruits. The colour is dark brown amber. Good advices for the Old Barbados: Try it with almond cream or vanilla ice cream. It is perfect with a moderately strong cigar and the harmony of flavors will delight. Rum Company is a young firm established in 2009 by Martin Heim, Wolfgang Weimer and Frank Zimmermann. It started with a passion for rum – especially rum that go with a good cigar. A big part of their products are limited edition, and Rom Company have already won separable prizes. Rum Company defines their rum on the basis of taste, finish, nose and general impression. Until they achieve their goal, they blend different types of rum.